I tend to stockpile ingredients when they go on sale and subsequently had a ton of ground beef hanging out in my freezer. I also had a ton of canned tomatoes, but I’d made chili recently and didn’t want it again. So naturally, the answer was meatballs. 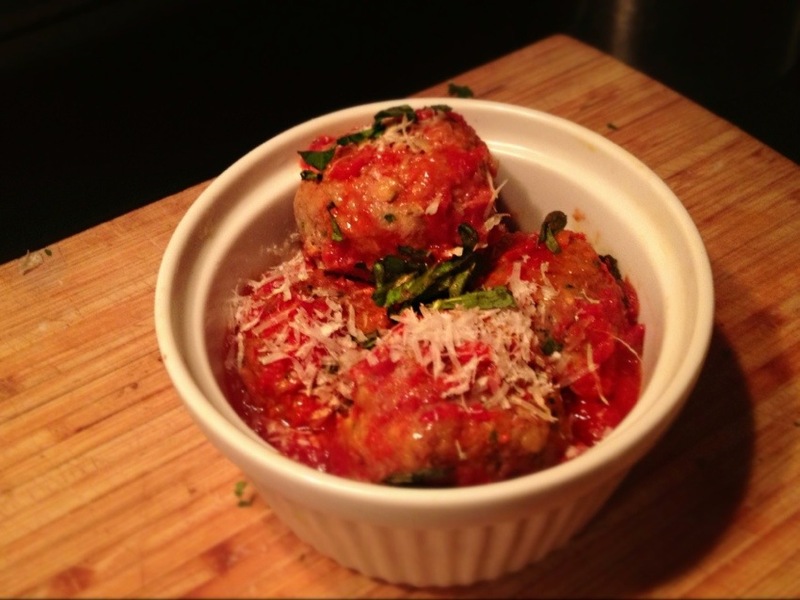 Not just any meatballs, but meatballs with a kick in a spicy tomato sauce. I served this over wilted spinach and cheesy polenta, but you could also toss this over spaghetti or stuff them in a sub. A few notes – you really want to make sure you’re buying high quality ground meat (remember Pink Slime? ), that doesn’t contain any fillers. If you have the time and patience, you could even grind your own meat. The same rule applies to the tomatoes – look for a boxed or quality canned variety without any additives. Finally, though these pair wonderfully together, you can also make them separately – they’re equally good on their own. 1. Drizzle a little olive oil into in a pot set over a medium-low flame, then sauté onion and garlic until softened and translucent, about 7 minutes. 2. Add the chopped tomatoes and chili flakes to the onions and garlic, then season with salt and pepper and stir. Lower the heat and simmer – covered – for 25-30 minutes until thickened. Stir occasionally to break up the tomatoes. 1. Combine the breadcrumbs, oregano, chili flakes, Parmesan, parsley, and salt and pepper, then gently fold in the meat, milk and beaten egg. 2. When mixture is totally combined, form into 2″ balls, handling the meat as little as possible. 3. Place a large pan over medium-high heat and coat with a tablespoon or two of olive oil. Drop in the meatballs and cook each side for 2-3 minutes until browned. 4. When meatballs are browned on both sides, pour in the sauce and reduce the heat to low. Cover the pan and let the meatballs simmer in the sauce cooked through – about 15 minutes.